In its 2nd year running, Kaleidoscope is an event jointly organised by Collateral Damage Studios and NUS Comics and Animation Society that showcases digital artwork from local and regional talent, and all aspiring artists are welcome to send in their submissions. This year the event is expanding beyond just Anime-based artwork, and encompassing digital art of all forms. 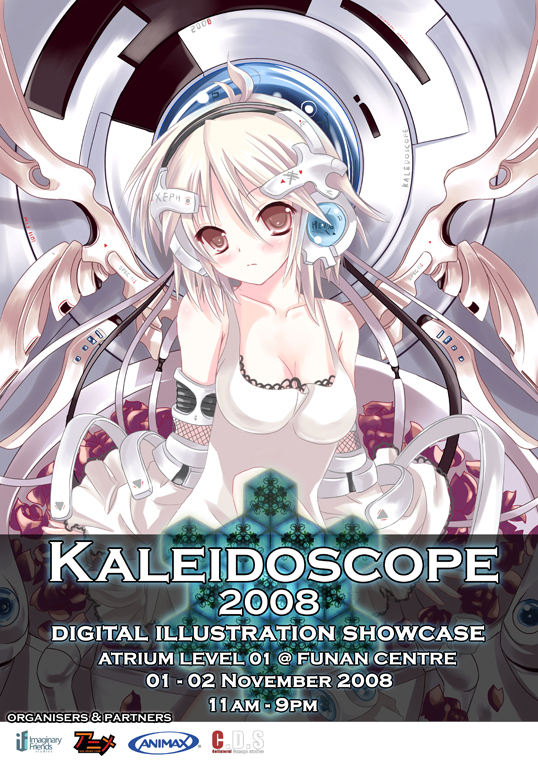 While the last Kaleidoscope was held at Suntec, this year it will be held at Funan the IT Mall from 1-2Nov 2008, 11am-9pm on both days. The NTU Visual Arts Society remains a firm supporter of this event. If you are interested in sending in your artwork for display, the NTUVAS is helping to collect submissions from the NTU student population. It doesn’t matter if the artwork involved is 3D modeling, 2D art, or not even digital at all, you can send in your submissions to ntucomicsensemble@yahoo.com.sg by the deadline of 14/10/2008, and we’ll help you showcase it during the two day event. we require the artwork to be a 300 dpi JPG file. - A render of the image with resolution of 300 dpi 2480×3508 pixels. - Please do remember to credit yourself. - If the artwork is a fanart, please do also credit the original creators. - Also, if you are part of a Studio/ Art group, pleae do specify if you want to be listed under them or as an individual. For more information, you can consult the main organiser Collateral Damage Studios. Even if you aren’t submitting any work, do come down on the two days and marvel at the huge variety of artwork produced by our local community!